In my last blog entry I promised to talk about the rope-in gasket installations. Before I can do that, however, we need to define the different gaskets used in the automotive industry. There are two types of gaskets used in auto glass mounting, the “H” style gasket and the “S” style gasket. 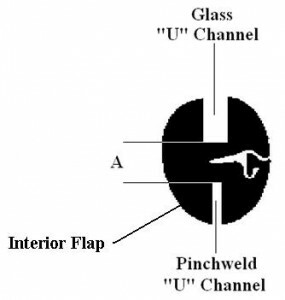 The “H” style gasket is one that wraps around the pinchweld and the glass installed into it is smaller than the part opening by the measurement of “A” as shown in the diagram below. 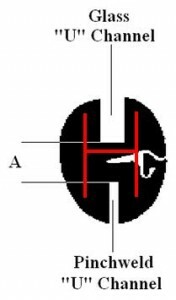 The “H” style of gasket is one that does not allow for a rope-in method of installation because of the rather thick and inflexible interior flap. The designed installation method for this type of gasket is the lip-in method which we will address in a later post. The reason that this gasket style is more versatile is because of a hinge-like interior flap that allows for the easy pivot of the flap for rope-in installation purposes, or it can have a locking device like an insert bead or self-locking flap that tucks into itself. 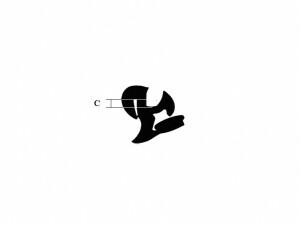 These locking devices allow for the lip-in style of installation. The understanding of the two types of gaskets is important because we will be referring to these later on when we talk about glass-cutting. There are a number of skills that the modern day technician seldom uses or may have never used during his current tenure as an auto glass technician. New technology overtakes the old methods or the vehicles that use the old methods of mounting have disappeared. However, even though some skills are not used every day, a technician will have a need for them once in a while. These seldom used skills include setting gasket set glass parts and cutting laminated glass. For the sake of those who service the trucks and farm equipment in rural areas and for those who may turn down installations because of fear of doing gasket sets or glass cutting, I decided to address these lost skills in a series of posts called “The Lost Arts.” Current auto glass technicians may go months or years without seeing a gasket set windshield or being asked to cut flat laminated but the art should not be lost. On the contrary, I think that a true auto glass professional should be well versed in all aspects of their career including gasket sets and laminated glass fabrication. I get calls at least once a month from techs in the field who are struggling with a truck or car with a gasket (weatherstrip) mounted glass part. 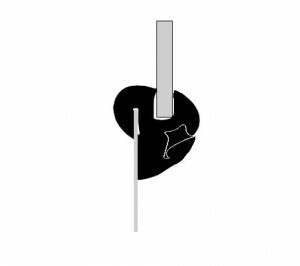 They are unsure of whether to rope the glass in or lip it in, whether to insert the chrome before or after the glass is in place, or to seal the gasket to the body or to the glass or both. 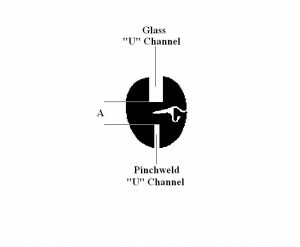 The act of installing a glass into a gasket is an acquired skill that takes practice and proper tools. Practice with gasket sets may be hard to come by because of their rarity but I plan to give you some pointers that will help even if you don’t see them often enough to master. Have you heard the terms rope-in, lip-in, gasket, weatherstrip, insert, locking strip or self-locking lip? If so, you will find this series of posts quite interesting. I will do my best to explain and include all of the terms that have been used to describe the process, parts and tools of the gasket set installation. If anything is confusing to you, please don’t hesitate to ask for clarification. I invite all of you old-timers out there to throw in your 2¢ worth as well. It will be fun to hash out and share our experiences. How many of you out there remember the DW819 with chrome or the DW685 with the two types of chrome and double lip gasket? Do you remember the DW831 Jeep Cherokee with that top chrome and tight corners or the foreign gaskets that were vulcanized to the glass and body? These early gasket models may be very rarely seen anymore but other parts like the DW848/813 Chevy Pickup or the DW763 GMC G-van, may be seen even today. Next week we will start with the gasket set roped-in installation. See ya then.